Hi there everyone! Today I am sharing our refreshed master bedroom for the winter months. Brrr… I am not a fan of winter time at all. In fact, I sort of get that seasonal depression thing. Not full blown or anything like that, but you can ask my friends about it. I do go into hibernation most every winter. I thought refreshing our bedroom would perk me up this year. I just shared our Winter mantel and I am enjoying it. A while back, I shared my Homegoods curtain hack with you. 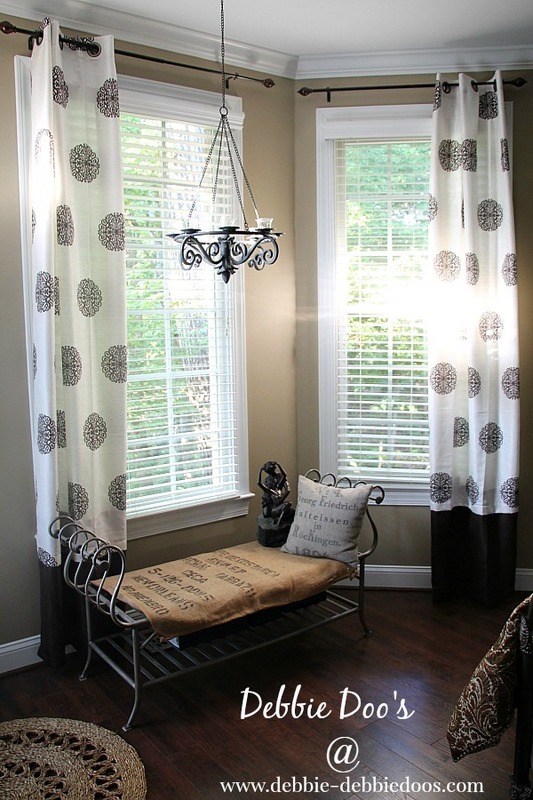 I seriously love those curtains and you can’t beat the price or the easy fix to lengthen them. Our master bedroom refresh basically started there. I love to change out our comforters. I do twice a year at least. In fact, I don’t know about your husbands, but for some reason mine is hard on things. His side always gets worn out faster than mine? What’s up with that?! I love warm rich colors but not to the point where it seems dark and drab in a room. These are the only windows we have and they back up to the woods. Therefore, not a whole lot of natural light flows in. It’s great for sleeping though I tell you that much. As for the accessories, I used what I already had. This salvaged piece behind the candle we have had for a few years. I found it tucked away in the closet and thought I would pull it out. Have I mentioned I hoard things? 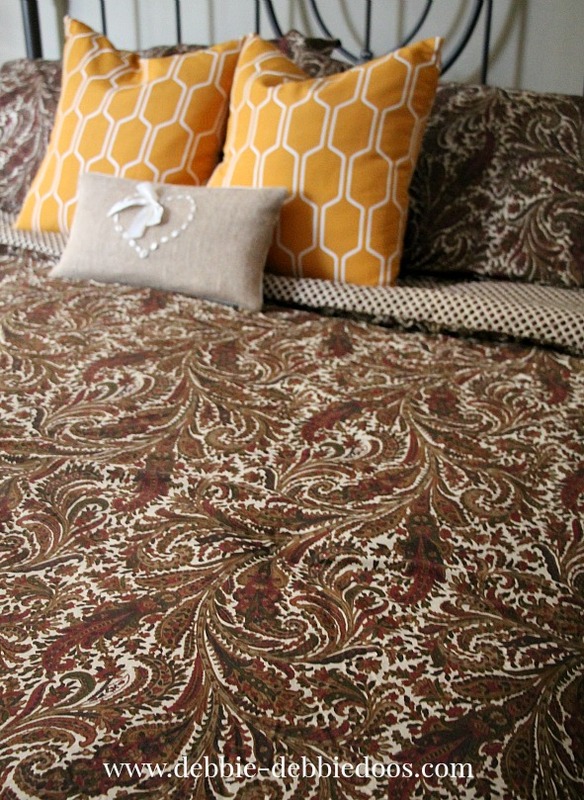 The bedding I found at Home goods and loved the Paisley print. I really love Paisley and always have. 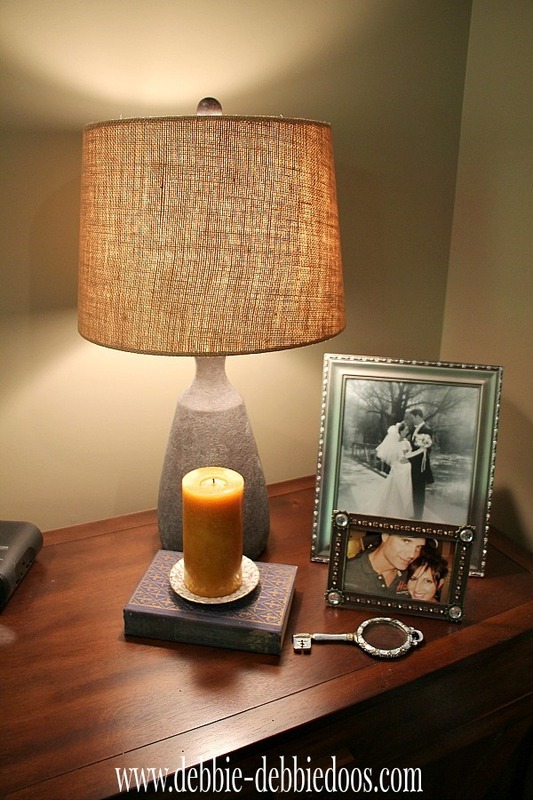 I loved the new lamp with burlap shade. I was in need of a taller one. The one I had there was too stumpy. 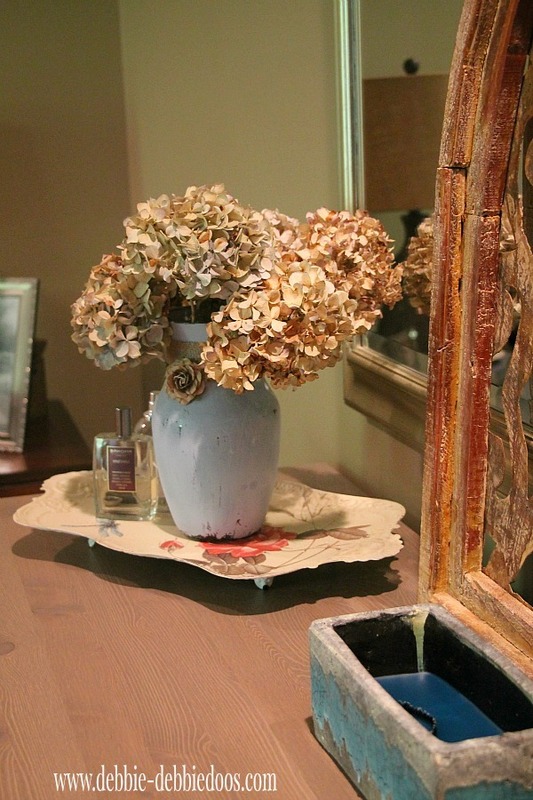 The vase here I painted years ago with Chalk paint and the dried hydrangeas. The bedding is Ralph Lauren. For the King set with shams and the bed skirt it was very reasonable. It probably is last years design but who cares, I love it. 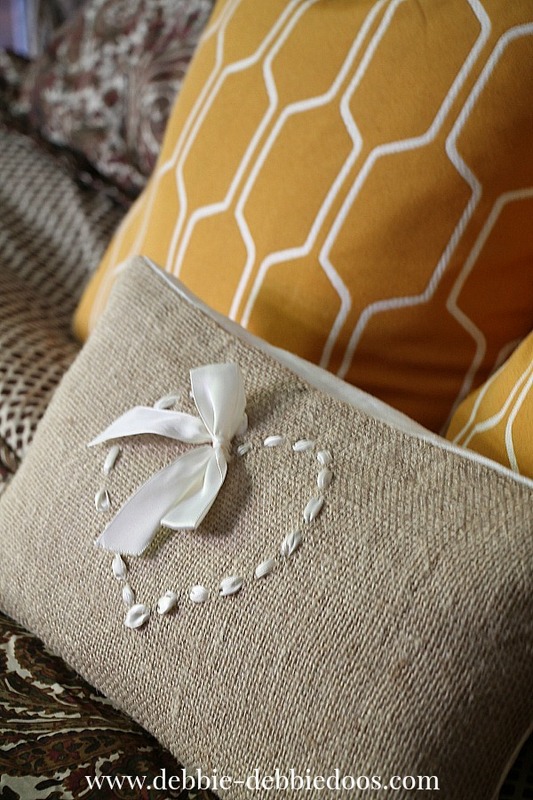 My cute little burlap heart pillow was a perfect addition. That was made by Ann from On Sutton place. She does beautiful work and if you ever are in need, or want some custom linen work, go check her out. 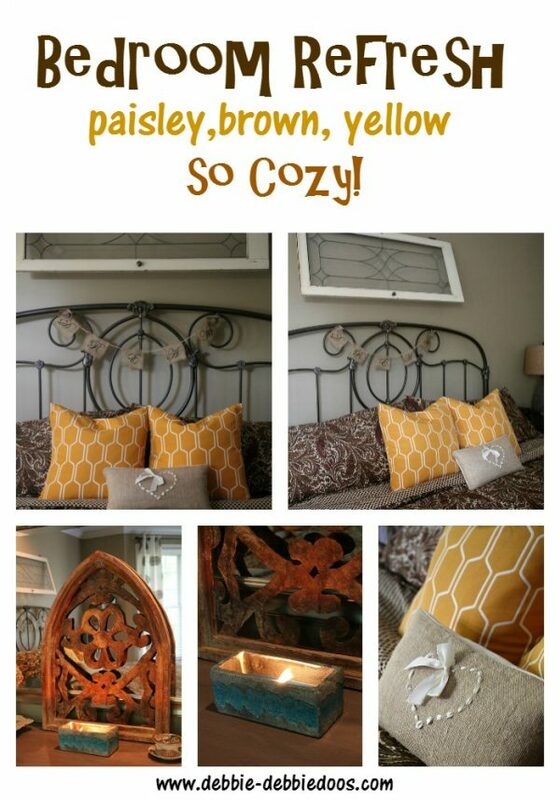 I decided a pop of yellow pillows, which is my favorite color along with blue would go well with the bedding. I didn’t change the bed skirt. I have issues doing that, it’s just too hard and besides the white looks nice with the draperies. I think I will not change out this room for a while. I am digging it, and even in the Summer, I think with some pretty white pillows it will transition well into the season. I say that now, but who knows! That little lamp shade you see embellished, I did that years ago. I love to embellish lamp shades! Thanks for stopping over today. Always nice to see you. If you are not a regular here, I sure would love to see you back again. I share lots of crafts, diy’s on a budget and a recipe or two on occasion. New edition to the master bedroom. 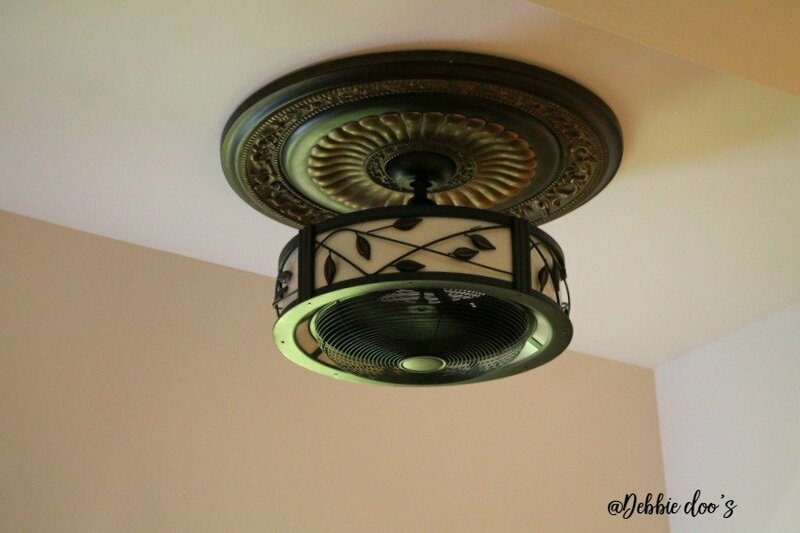 Light/ceiling fan combination in a pretty bronze color. Nice, warm and cozy for sure. Could crawl into that bed right now! I think I want to lol! LOVE it, Debbie. I’m with you on paisley. One of my favorite patterns. You did a beautiful job, as always. Yes good eye Jane! I forgot that is where I purchased that tray. Looks great Debbie! I have several different bedding sets as well..and change them often! Here’s hoping the winter isn’t too harsh where you are. I am not a fan of the winter either…the snow just started to fall here and I’m hoping it will melt soon!! I hope it melts too. I am not a fan of snow. Living in Buffalo NY most of my life cured that kick for me. Thanks Mom! You know we rest well in there. It turned out so pretty. Love the new bedding and your window section is my fav, those curtains look gorgeous there!!!! Thanks Shannon! The curtains are my fave too. Lovely shades. My room is in vintage cream and purple and amethyst. Yours look warmer ! Love it. 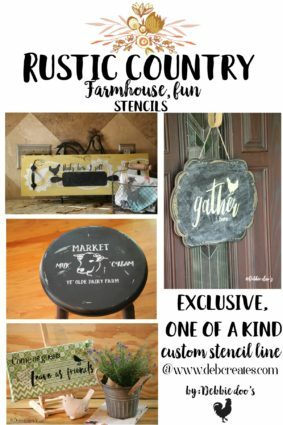 I see (and love) your creative, crafty and cozy touches all over your beautiful retreat! The pops of yellow are really pretty against the paisley, too! Thanks so much Becca! Happy new Year. This looks beautiful, Debbie. Our bedroom has been lacking in that cosy factor since summer, perhaps its time for a switch up? Yes, it is time! Breaks up the long winter months. 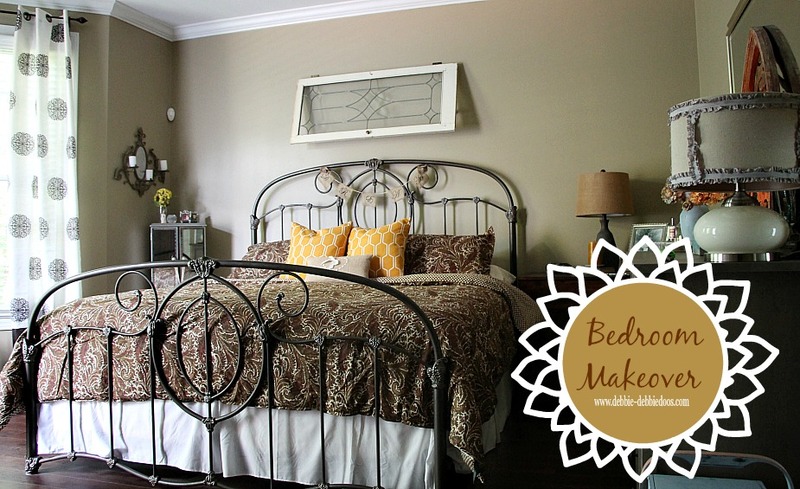 Love your bedroom re-do! Cute styles and love the color combo. Im redoing a couple rooms my self soon and was looking for ideas, this helped thanks! Love your bedroom. I have trouble picking wall colors. Looking on your site for the wall color on your bedroom; must have missed it. Do you remember what it is? It is called cappuccino by restoration hardware. We used Benjamin moore paint to color match. Thank you. Funny, it does not photograph brown; thought it was more a linen color. Will go get some samples. Debbie..your bedroom looks great..love the new bedding and color choices.Who would not want to sleep in such a cozy bedroom? I’ve got the answer to your question of why the mans side of the comforter wears out quicker….it’s from all the tugging to get their fair share of the covers back in the middle of the night. Cozy and warm looking Debbie. 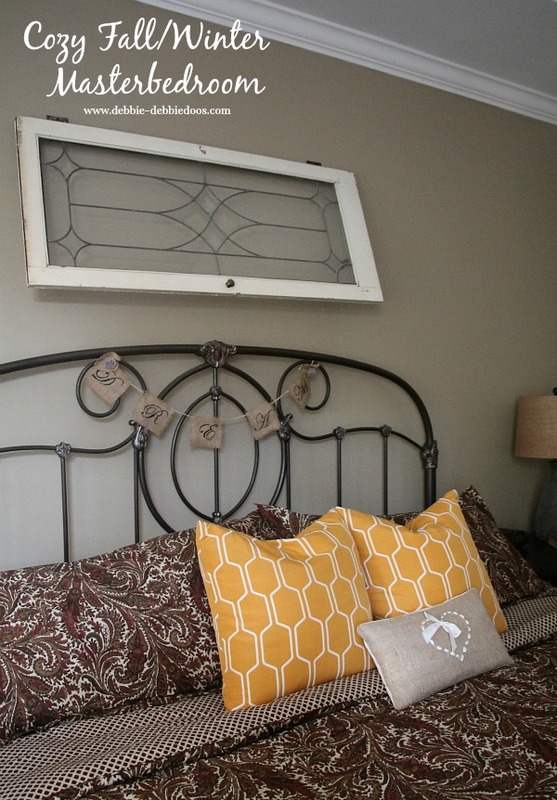 Love the salvage piece and the “window”. It’s about 20 degrees here today and will be about 5 degrees tomorrow. I don’t want to go outside. January weather in Ohio is arriving. Take care and stay warm and cozy in your pretty room. I love your refreshed bedroom. The yellow pillows brighten it up. I really like the burlap lampshade and the burlap pillow! I am digging your master bedroom for winter too!…and I can just see it transitioning so beautifully from one season to another!! !…Loved all of the beautiful details and that cute pillow by Ann!!! Beautiful room makeover Debbie!! Pretty! I wouldn’t want to change it too soon, either! I’m a paisley fan – drawn to it like a magnet. Love Ann’s heart pillow! Your room is so lovely and cozy, Debbie! 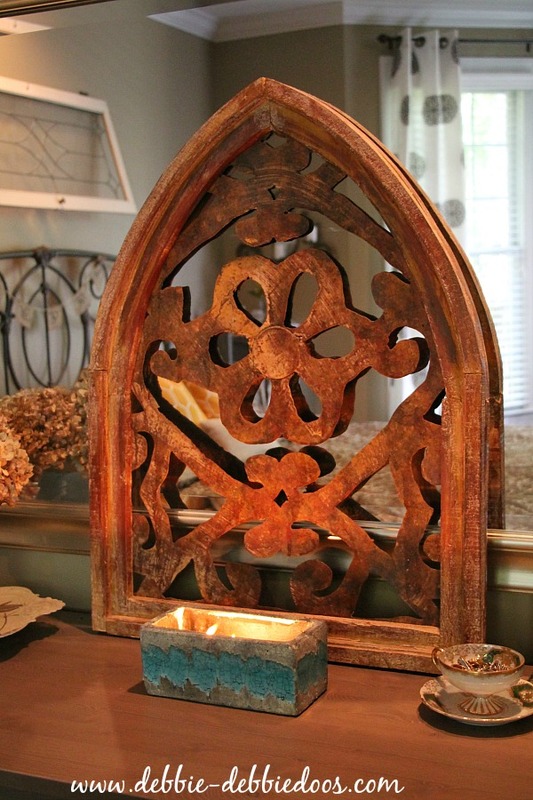 .I love the salvage piece…so fun when you can shop your closet! Very pretty and easy updates, Debbie! Love the bedding. We are going to be painting our master and I have been looking at darker neutral shades than the beige that is there now. I think bedrooms are one room that can handle a darker color since you are sleeping in there anyway. I figure if I stay neutral I can bring in any other colors when I feel like. Plus, it will go with my Duck Egg painted furniture and our iron bed, too. It looks perfect! Love the coziness of it all! I know what you mean about the winter blues! Love, love, love your Winter bedroom Debbie! Such beautiful touches. Love the ceramic candleholder and the sweet pillow! Your bedroom looks so pretty Debbie…I love your new bedding and that pretty salvage piece you have leaning against your mirror! So pretty Debbie, I’m loving that light by the windows, it’s gorgeous! Your room is so warm and cozy. Your accessories are absolutely amazing! 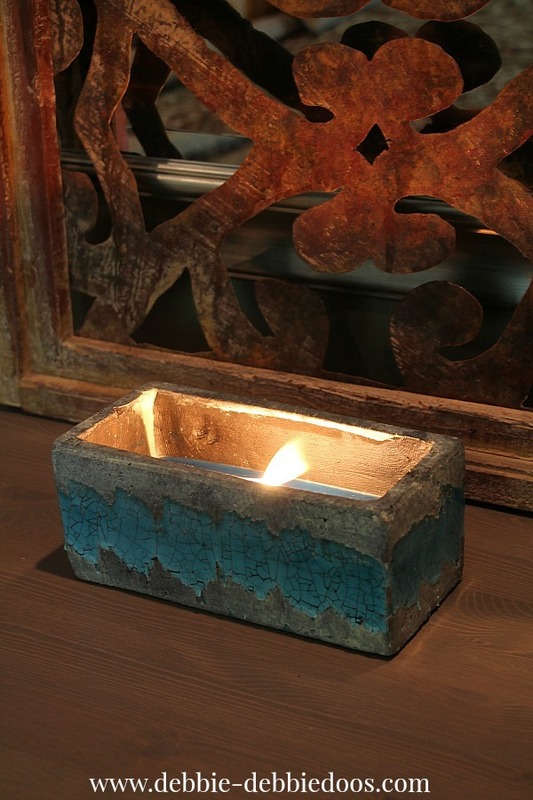 Love the vintage salvage piece.